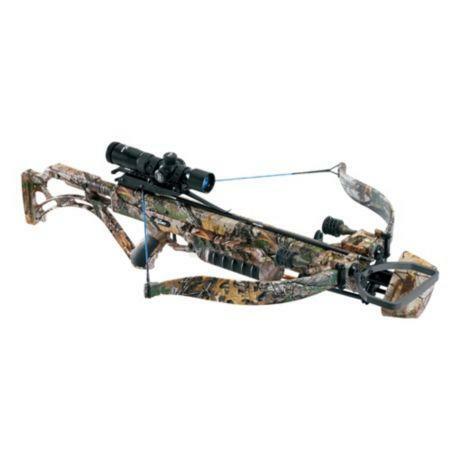 The whopping 280 lbs draw weight can be considered a critical drawback and makes this crossbow not just for anybody. This crossbow is the top of the line for this manufacturer’s Matrix line, and that shows in the tiniest aspects that should be taken into consideration. It is a powerful weapon that proves that nothing can stand in its way, and seeing the speed and performance it offers, it is clear why many hunters consider it the weapon of choice, or, at least, the one that they desire most. While the company discontinued the previous model in the line and replaced it with the Bulldog, it is a winning situation, as most of the benefits that make the Matrix line such a good option for seasoned hunters are found on this model. Plus, this one is more reasonably priced compared to its predecessor. From the very first look at this model, you will know that you are looking at a crossbow that will get the job done. It is well built and a proof of the company’s continuous dedication to designing crossbows that will withstand any field test. Also, what you’ll surely like about the Bulldog is that it is straightforward to operate and will not have a steep learning curve, even for someone who hasn’t yet used a crossbow. The Bullpup stock is the same that you see on rifles, and it is a feature that grants more stability to this crossbow. Shooting at large distances becomes much easier due to this element found in the construction. Also, you must take note of how the stock balances the overall weight of the crossbow and makes it easier to manipulate. As there are no moving parts, the Bulldog is built like a brick house. You will be impressed with how stable it feels, from the first moment you will hold it in your hands. The twin PowerLoad limbs that come along with a string and cable system for solid performance will show you what this model is made of. The fiberglass and composite construction keeps the weight to a manageable level while increasing sturdiness. The model comes with a Quad-Loc riser that contributes to the overall solid appearance of the Bulldog. The limbs won’t move and will be kept in place when you’re shooting arrows, which will also have a positive impact on the stability of your shots. Developing speeds up to 400 fps, the Bulldog is an ideal choice for hunting the biggest game you can find. 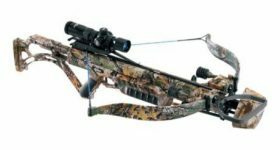 There are many excellent add-ons available on this model that will convince you that it is an attractive option for anyone who wants a sturdy, easy-to-shoot crossbow. For instance, the Twilight DLX illuminated scope will offer you the possibility to aim and shoot when the light conditions are far from ideal. Don’t forget that you don’t get just the crossbow, but an entire package when you purchase this particular model. You will get a quiver and four Diablo bolts that will allow you to go hunting right away. A trigger guard comes incorporated in the build of this crossbow, to ensure that you won’t shoot arrows prematurely. Also, there’s an adjustable cheek piece included, and one great thing about it is that it can be used by left-handed and right-handed shooters alike. Don’t forget that you’re also getting a rope cocking device that will allow you to compensate for some of that considerable draw weight of 280 lbs. You will appreciate the presence of the anti-dry fire mechanism. Should you dry fire by accident, the device will catch the string, and this way, you will not accidentally let the wildlife around know that you are hiding in the brush or a tree stand. Another thing that is much appreciated by many shooters is the release feature. The latter eliminates the need for shooting an arrow into the ground just so that you can recock your bow. Are you interested in what noise-canceling features are present on this model? Any crossbow should have such features in place, as, otherwise, releasing an arrow will be accompanied by a lot of noise and that would alert the prey you are trying to catch. In this case, the crossbow comes with REDS suppressors which are considered quite effective in eliminating noise and vibrations caused by a released string. This system comes as two rubber bumpers that will cover the string with the purpose described above. Knowing that you won’t risk detection when you shoot will give you peace of mind and allow you to focus on taking your aim and landing clear shots. The Bulldog truly deserves its name since it is a force to be reckoned with. At 400 fps, it can drop any game on the planet, and its speed is supported by other elements of design, such as the Bullpup stock and its overall good balance. Equipped with plenty of useful extras, such as an illuminated scope, and fully packed with a quiver and arrows, it is the kind of crossbow you will want to shoot like a hunter.